As stated in the official website of this bishoujo franchise, a new animation series will be launched for the Dog Days, dubbed as the Dog Days’ (read as Dog Days Dash). A video began streaming the Biscotti version of the initial teaser for this new season, creating a buzz of anticipation for the project’s fans. This new series has been primarily announced at the special promotion for the Dog Day’s animation. This was held in the Flonya Festival event last October 2011. In this occasion, details for the animation were announced. Dog Days’ is set to premiere this coming July 7. 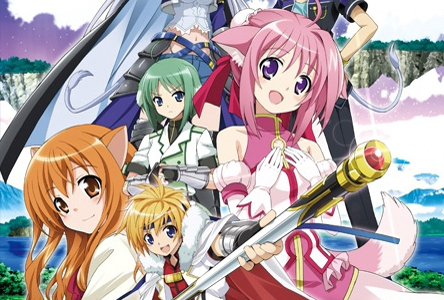 The initial Dog Days series is a fantasy animation which is created by Masaki Tsuzuki. The story takes a highlight on Cinque Izumi, who was sent to the alternate world by the beautiful princess Millhiore in order to defend her kingdom, Biscotti. The neighboring kingdom of Galette was planning to conquer them to overtake their throne. Cinque is a half Japanese, Half English boy, studying at the Kinokawa International School. He was living a normal life until he was summoned to Flonyard, a place where everyone looks a bit different from humans—they all have animal ears and tails! Given the status of a knight, he receives a sacred weapon and turns from a regular boy into a hero to fight the enemies. However, the battle is done in a method similar to sports competitions. Voice actresses / singers Yui Horie and Nana Mizuki will contribute to the series by providing the opening and ending songs. Horie will sing the Natsu no Yakusoku, translated as the Summer Promise. This new song is featured in the trailer’s new ad.